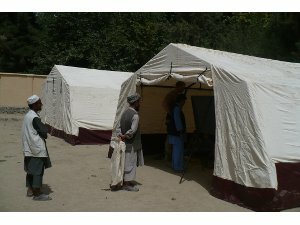 Afghanistan 2009 – school tents and school material. Charity Cat donated € 1500 to support the reconstruction in Afghanistan. On-site with the help of a PUMA employee they bought 2 school tents and school material for the Said Abdullah Rahman School in the province of Taloqan. The school was built in 1975 and currently there are 5800 boys and 200 girls visiting this school. Due to missing class rooms there are open air lessons and the tents dramatically improve the conditions for the pupils.